Since 1994 Petersen’s Automotive Museum in Los Angeles has provided car enthusiasts with a vast display of unique automobiles. Stretching out over 300,000 square feet, the museum has around 150 vehicles on display at any given time. They are famous for the wide variety of vehicles within their collection, many of which have been donated, as well as their unique rotating displays. Avid car collectors and admirers from all over the country come to visit this museum. Their newest exhibit, however, is sure to draw the attention of pickup truck connoisseurs. Pickups: The Art of Utility is a new exhibit, which explores the history and evolution of pickup trucks over time. The emphasis is on the variety of uses for pickups, from irreplaceable work vehicles in some settings to lavish toys in others. The pickup was initially intended to be a rugged laborer, but has gradually turned into a more common, everyday type of vehicle. This new exhibit at Petersen’s Automotive Museum examines the progression of pickups in a way that is both fun and interesting. Unlike most museums, Petersen’s utilizes creative displays, referred to as the Streetscape diorama. 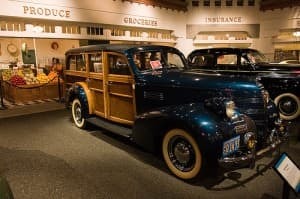 These unique exhibits take you back in time, to when each vehicle was considered modern and trendy. When viewing these pickups you won’t just explore their history, you will feel like a part of it. Visitors to Pickups: The Art of Utility will encounter one-of-a-kind trucks, including a 1909 International Harvester, a 1938 American Bantam, a 1941 Studebaker Coupe Delivery, a 1948 GMC, a 1953 Dodge Swivel Frame, a 1958 Jeep, a 2000 Ford Ranger EV, and more. This range of selection cannot be found at any other location. 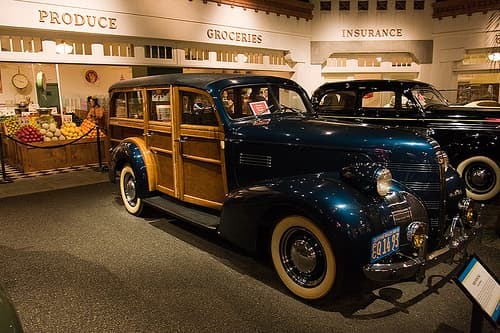 Whether you are interested in the history of pickup trucks, or you simply enjoy viewing antique automobiles, you are certain to find this exhibit irresistible. This is also a great educational outing for children. This is a limited-time event, so you must hurry if you wish to experience this exceptional display. Although this exhibit just opened on June 15, it will only be available until April 6, 2014. Don’t miss out on your chance to experience the history of the beloved pickup truck at Petersen’s Automotive Museum.